At the University of Oregon, we are a values-based community that exemplifies that in our recruitment process.. 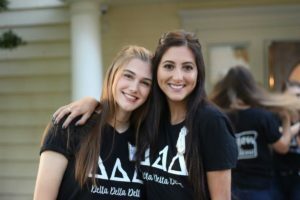 This process is designed for potential new members to connect with women from all 12 chapters and learn more about how each one encompasses the Fraternity and Sorority Life values. 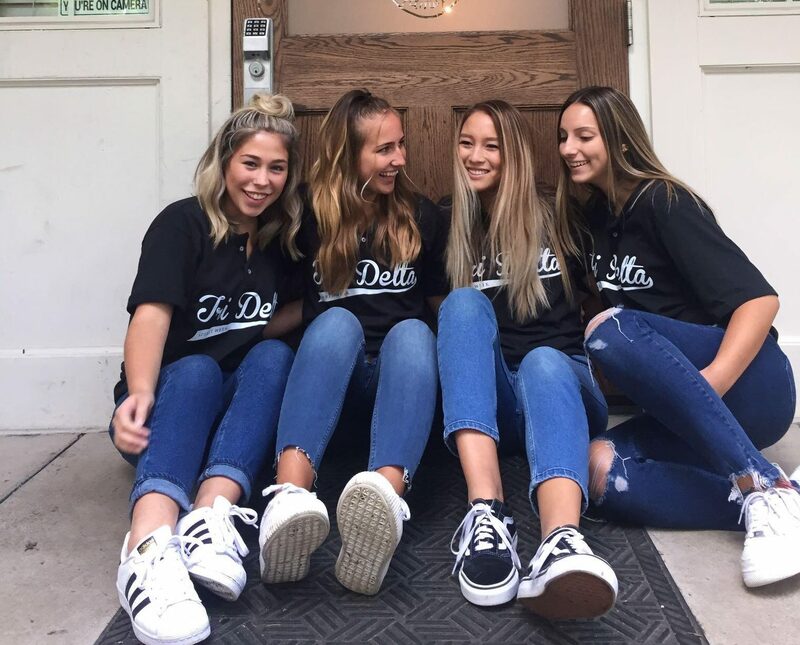 The five pillars of our community are Scholarship and Learning, Community Service and Philanthropy, Brotherhood and Sisterhood, Leadership and Engagement, and Community Awareness. 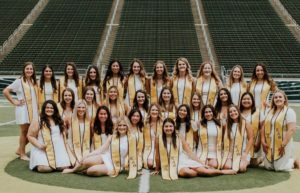 It is important that a values-based recruitment guides women to an organization that will help enhance their growth and development at the University of Oregon, even beyond joining a sorority. The Panhellenic Community strives to make each organization’s values and our community’s values the predominant focus during the membership recruitment process. We believe that sorority membership guides each individual towards becoming the best version of themselves and the recruitment process is only a single step. For more information on our values, please look below. One of the most gratifying aspects of Panhellenic life is the sense of satisfaction and pride which comes with involvement in philanthropy and community service. As a Panhellenic community, we strive to work together to create a cohesive, philanthropic community. Fundraising events of many kinds are organized each year by fraternities and sororities in order to benefit charities. Such projects help build moral character through the realization of the needs of people less fortunate. Each year, individual chapters participate in philanthropy projects to raise money that goes towards the non-profit organization that they support. Aside from philanthropic events, our Greek community is very involved in community service projects. Whether visiting residents of a local nursing home, painting public buildings or reading to preschoolers, the fraternity/sorority member experiences a feeling of well-being and a sense of worth that comes from the simple expression of care for others. 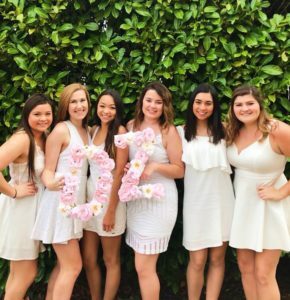 Recently, the University of Oregon adopted the national Panhellenic philanthropy, Circle of Sisterhood. This non-profit organization was founded by sorority women on a mission to raise financial resources to help remove educational barriers for girls and women facing poverty and oppression. Circle of Sisterhood has been able to grant over $675,000 to organizations working in 22 different countries and has funded twelve school builds in Malawi, Senegal, Haiti, Nepal and Nicaragua since its founding in 2010. Here at the University of Oregon, we partake in several different events to help raise money as well as awareness for Circle of Sisterhood. We have had events ranging from documentary showings and sundae nights to volleyball and powder puff football tournaments. 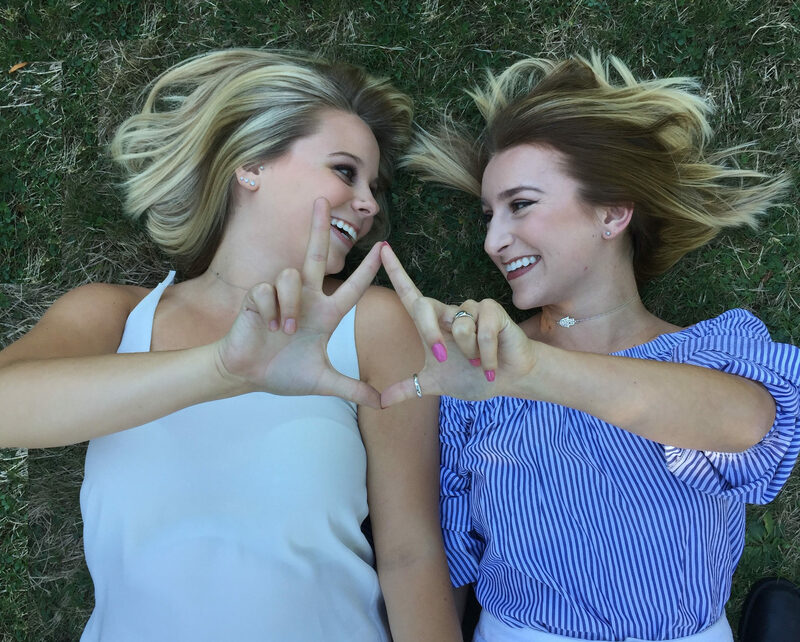 From Bid Day to graduation, our members celebrate their bonds of friendship with their sisters in several ways. The friendships made within our chapters last a lifetime, and we pride ourselves in being one community of Panhellenic women. Our sisterhoods provide some of the greatest support systems during the collegiate experience, as well as incredible networking opportunities and lifelong relationships beyond college. Our chapters empower women to be leaders, mentors, and strong individuals, as well as provide eternal memories as highlighted below. 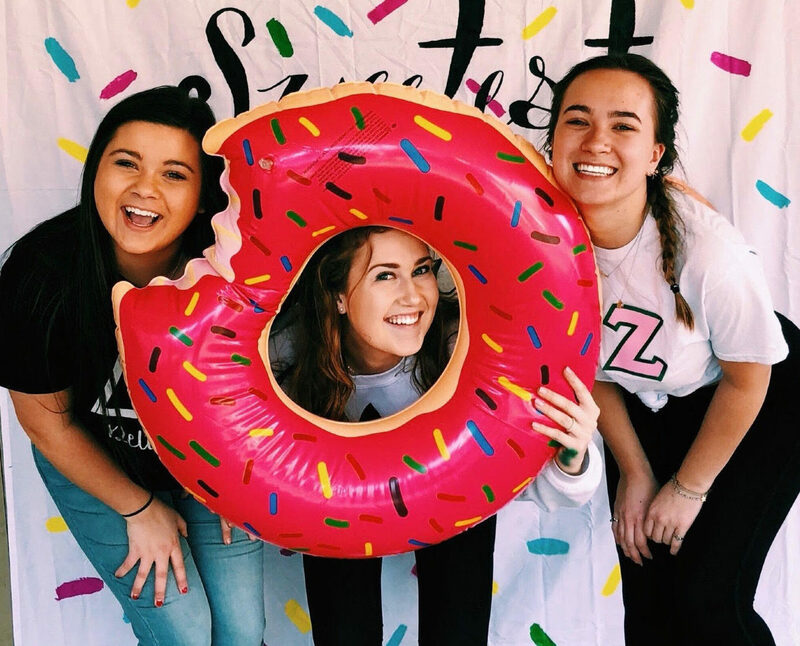 Philanthropies, socials, and sisterhood events provide opportunities for sisters to grow closer, but our campus traditions of sisterhood retreats really define the closeness of our bonds. Many chapters hold sisterhood retreats at the Oregon coast, local hiking destinations, and other venues such as the trampoline park, ice skating rink, or the pumpkin patch. These retreats can be overnight or just for a few hours and encourage women to meet more sisters, share their experiences, and grow as a chapter. Additionally, chapters hold events with other chapters to spread Panhellenic love and unity. Whether it’s a joint hike and brunch, a game of dodgeball, or campus-wide dinner swaps, our Panhellenic chapters celebrate one united sisterhood. We do this by supporting other chapter’s philanthropies, as well as our campus wide philanthropy: Circle of Sisterhood. The active Panhellenic community provides so many different opportunities to strengthen the bonds of sisterhood, and try something new here in Eugene! “Big and Little” is a tradition that is seen across many university campuses. A big sister’s job is to take a new member under her wing and help integrate the “little” into the sorority. Although, to many big sisters, this relationship means so much more than that. The bond between a big and little is very special and often times becomes a bond that is lifelong. 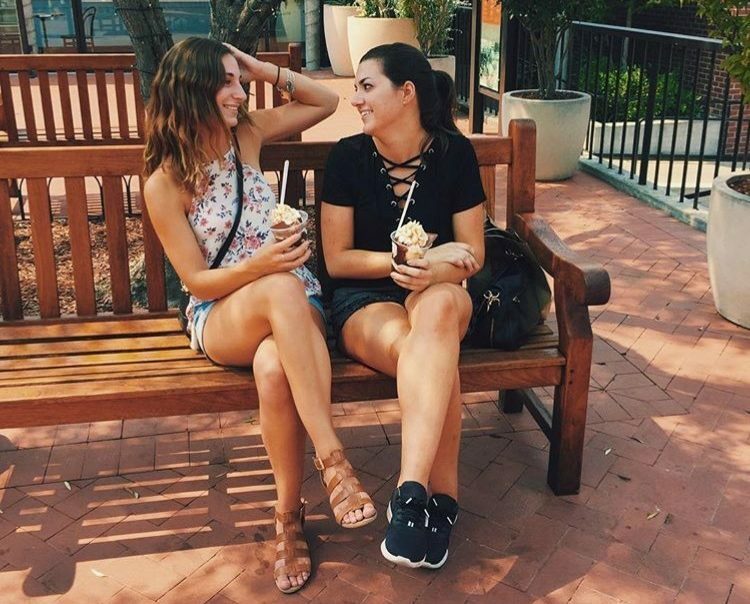 This mentorship program has seen many successful relationships over the years and many women have stated that their college experience would not have been the same without meeting their big sister. This old sorority tradition embodies the true meaning of sisterhood. Our Panhellenic community prides itself on holding all our members to a high academic standard. 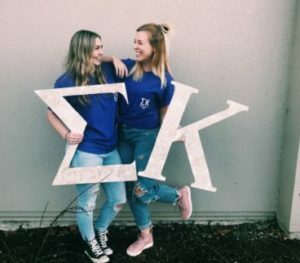 While each chapter has a unique scholarship program, all our members push their sisters to better themselves and strive for their personal best. Our chapters use many different resources, such as proctored study hours, incentive programs, and scholarship dinners, to help their members reach their academic goals. Panhellenic Council assists in these efforts by offering guest speakers, workshops, community wide study tables, scholarships, and assistance to any chapter’s scholarship chair. Every year, at our Greek Excellence Awards, we award multiple scholarships to outstanding women in our community. While the scholarships vary by year, there are always many opportunities for our members to receive financial rewards for their hard work and academic success. Additionally, this coming year, we will begin awarding a Panhellenic-wide scholarship available to all active members. For more information on all scholarships, please contact [email protected]. Every community of people encounters issues that negatively affect it. Our community is dedicated to identifying the issues relevant to us and addressing them accordingly. However, being a member of our community is more than an individual experience. It means you’ll be a part of a legacy that you help to define. Working towards solving the issues relevant to our community shows our dedication taking care of one another and our legacy as a community. The Panhellenic Council works with chapter leadership at our weekly meetings to address these issues through open discussion. We facilitate these discussions and work together to develop solutions to community-wide issues that have a negative effect on chapter operations and hinder the fulfillment of our community purpose: to create a unified community of women who strive to better themselves and their university community. 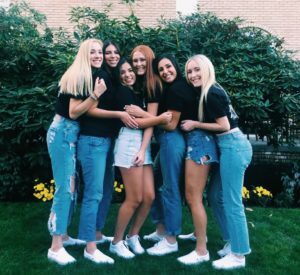 The University of Oregon’s Panhellenic community is a group of diverse women that are united in their respective pursuits of leadership and community involvement. Through the Panhellenic community, every student has ample opportunity to foster relationships and refine skills that not only directly impact our community tremendously, but also translate into the professional world. Our community opens an infinite amount of doors by both inspiring and empowering women to be the best version of themselves and to share that within the Panhellenic community and the University-at-large. Listed below are a few examples of the opportunities that women have within the Panhellenic community to engage in leadership and personal development. The Junior Greek Council provides an opportunity for younger members in our community who are interested in holding leadership positions within their chapter or the community as a whole to learn about what being in a leadership role entails. As students go through a curriculum structured around values and community engagement, they are exposed to the issues our community is facing and given the opportunity to implement change from an early stage of their collegiate career. The goal of Junior Greek Council is to create a foundation of awareness and knowledge that will create active leaders in our community to initiate change. The Greek Leadership Academy is a weekend retreat that invites leaders from the entire community, including Interfraternal Council and Panhellenic Council members, Fraternity and Sorority Life staff, and chapter presidents or other chapter leaders, to come together and engage in meaningful conversations surrounding our community. Through activities ranging from bonding to facilitate group discussions about issues facing our membership, this retreat allows for an open dialogue to exist between the entire community at the start of each year. Greek Leadership Academy creates a network of passionate leaders through relationship building with each other and advisors, and setting shared goals and ways to achieve such goals to set the tone for our community and sets the bar high for what we strive to accomplish. The Panhellenic Judicial Board, comprised of members from all chapters in our community, is responsible for upholding the bylaws and rules of the Panhellenic community. This board allows women from the entire community to be involved in disciplinary procedures by adjudicating cases that are specific to our chapters and our bylaws. This board plays a crucial role in the formal recruitment procedure as it handles any infractions that occur, and serves to assist the Vice President of Recruitment and Rho Gammas in ensuring a fair and equal recruitment process. The Unified Greek Conduct Board (UGCB) is a peer governing board comprised of FSL members from every Council: PHC, IFC, MGC, and NPHC. Working side by side with the University’s Office of Student Conduct, this board emphasizes the role of peer accountability and aids in maintaining a collaborative partnership with University administration. The University of Oregon Police Department Liaison Program assigns a specific officer to each fraternity and sorority on campus. This program allows for relationships to be built between the FSL community and the UOPD by establishing specific points of contact, giving advice for problems that face specific chapters and our membership, and providing educational presentations to the community about ways to stay safe and keep each other safe. The Emerging Leaders Retreat is a program designed specifically for first-year members of the University of Oregon Fraternity and Sorority Community to learn more about the history of Greek organizations, discover their personal values, and engage in activities that focus on leadership development. The goal of the retreat is to start a conversation amongst younger membership that will develop thought leadership and critical thinking in future leaders.